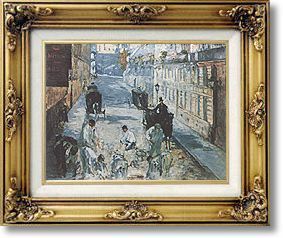 La Rue Mosnier with Pavers by Edouard Manet - no-risk guarantee! Edouard Manet was born into the Parisian bourgeoisie on January 29, 1832. By 1874, although Manet's reputation as experimental artist and leader of the Impressionists was firmly established, he never exhibited at any of the eight Impressionist exhibitions of the time.